Osama bin Laden's son-in-law has been convicted in New York of conspiring to kill Americans by serving as al-Qaida's spokesman after the Sept. 11 attacks. The verdict came after about five hours of deliberation in the case against Sulaiman Abu Ghaith, the highest-ranking al-Qaida figure to face trial on U.S. soil since the attacks. The Kuwaiti imam had testified during a three-week trial that he answered bin Laden's request in the hours after the attacks to speak on the widely circulated videos used to recruit new followers willing to go on suicide missions like the 19 who hijacked four planes on Sept. 11, 2001. "The storm of airplanes will not stop," Abu Ghaith was heard warning in an October 2001 video that was played for the jury. Also shown repeatedly to the jury during the trial were frames of a video made Sept. 12, 2001, that showed Abu Ghaith seated next to bin Laden and two other top al-Qaida leaders as they tried to justify the attacks. Sentencing was set for Sept. 8. The charges carry a potential penalty of life in prison. On Monday, during closing arguments, Assistant U.S. Attorney John Cronan underscored the importance of Abu Ghaith's post-9/11 status. "Going to that man was the very first thing Osama bin Laden did on Sept. 11 after the terror attacks," he said. "The defendant committed himself to al-Qaida's conspiracy to kill Americans, and he worked to drive other people to that conspiracy." He added: "During the most important period of time in al-Qaida's savage history, Sulaiman Abu Ghaith was Osama bin Laden's principal messenger. ... He used his fiery oratory to incite al-Qaida's growing army of terror in this war with America." 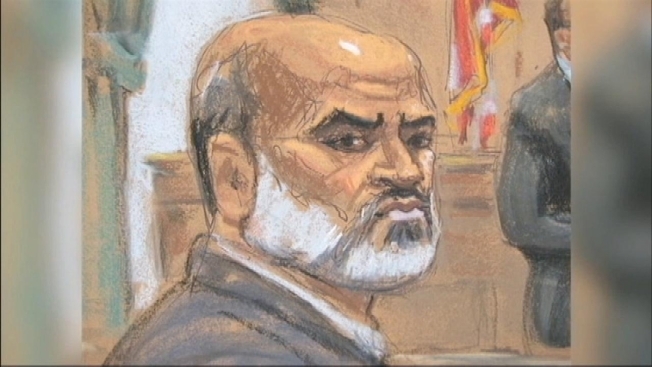 The jury returned a guilty verdict on three charges: conspiracy to kill Americans, conspiring to provide support to al-Qaida and providing support to al-Qaida. Captured in Jordan last year and brought to New York, Abu Ghaith actively participated in his trial. He listened to testimony and arguments through headphones linked to an Arabic translator. Taking the witness stand in his own defense, Abu Ghaith in a calm voice denied he was an al-Qaida recruiter and claimed his role was a religious one aimed at encouraging all Muslims to rise up against their oppressors. He insisted he agreed to meet with bin Laden in a cave on the night of Sept. 11 out of respect for bin Laden's standing as a sheik. "Despite knowing that he was responsible for the deaths of hundreds of Americans, you met with him to be polite, correct?" prosecutor Michael Ferrara asked on cross-examination. "I didn't go to meet with him to bless if he had killed hundreds of Americans or not. I went to meet with him to know what he wanted," Abu Ghaith said. Abu Ghaith's defense lawyer, Stanley Cohen, argued there was "zero evidence" that the 48-year-old former teacher knew of the conspiracies the government claimed he knew about. Citing the videos of his client, Cohen warned jurors not to let prosecutors "intimidate you and to frighten you into returning verdicts not based upon evidence, but fear." Prosecutors used Abu Ghaith's testimony and closing arguments as an opportunity to reshow the image of the burning towers to jurors. In his closing, Cronan used the defendant's testimony against him. "Accept it as totally true. If you do that, he's guilty," Cronan said.